Legendary Entertainment and Universal Pictures announced today that principal photography has begun on Detective Pikachu, the first live-action film based on the globally popular Pokémon franchise. Starring Ryan Reynolds (Deadpool series), Ken Watanabe (Godzilla), Justice Smith (Jurassic World: Fallen Kingdom) and Kathryn Newton (Three Billboards Outside Ebbing, Missouri), the film is from director Rob Letterman (Goosebumps, Gulliver's Travels) and writers Nicole Perlman and Letterman, with Eric Pearson and Tom McCarthy having completed the production polishes. The movie arrives in theaters in North America on May 10, 2019. Pokémon has delighted fans of all ages around the world for over two decades. With more than 300 million video games sold worldwide, 23.6 billion Pokémon TCG cards shipped to 74 countries, and an animated series spanning 20 seasons, Pokémon is one of the most successful entertainment properties in the world. A Detective Pikachu video game is coming to the Nintendo 3DS family of systems early this year where the new Detective Pikachu character will be introduced. The game is used as inspiration for the storyline of the film coming out in May 2019. As of now, the movie will be going up against TriStar's Rosie and STX Entertainment's Uglydolls. The original video game centers on a young boy named Tim Goodman, who meets Detective Pikachu, who can surprisingly understand humans. They team up to track down two Aipon characters who have been harassing citizens as they start solving more cases together. This movie adaptation will follow Tim Goodman who comes across the title character, as they team up to track down Tim's missing father. Kathryn Newton will be playing a sassy journalist who helps Tim and Pikachu along the way. We reported in October that production will begin in January, with the movie coming together on schedule, although there is no indication as to how long production will last. Before Ryan Reynolds signed on, he was on a studio short list of big action stars that they wanted for the role, including Dwayne "The Rock" Johnson, Mark Wahlberg and Hugh Jackman. 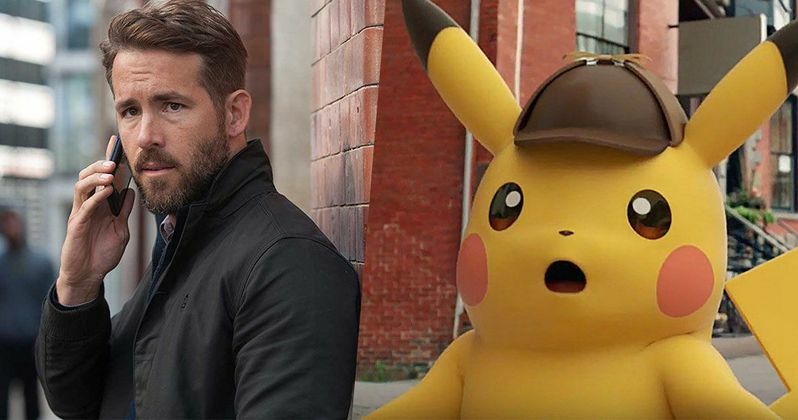 Mary Parent and Cale Boyter produce Detective Pikachu for Legendary Entertainment, while Joe Caracciolo, Jr. (Pirates of the Caribbean: Dead Men Tell No Tales, Logan) and The Pokémon Company's Tsunekazu Ishihara serve as its executive producers. Legendary's Alexandra Mendes co-produces. The talented creative team includes director of photography John Mathieson (Logan, Gladiator), production designer Nigel Phelps (Pirates of the Caribbean: Dead Men Tell No Tales, Transformers: Dark of the Moon), editor Mark Sanger (Gravity, The Jungle Book), costume designer Suzie Harman (RocknRolla, The Death of Stalin). The film's visual effects will be crafted by Moving Picture Company (The Jungle Book, Wonder Woman) and Framestore (Paddington 2, Guardians of the Galaxy Vol. 2). Universal Pictures will handle distribution of Detective Pikachu outside Japan. Toho will distribute in Japan, as it has done in its partnership with Legendary on the blockbuster monster reboot for Godzilla.